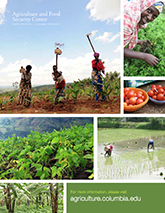 With recent technological advances, there are promising opportunities for more accurate and efficient data collection, better targeting of recommendations, and fast dissemination to individual farmers and communities. 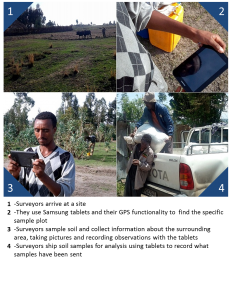 Broadly, ICT4Ag employs different mobile data collection tools to support spatial information systems. In this area, the AgCenter is developing tools and systems to diagnose soil constraints in the field, transmit the information, and receive quality recommendations back from specialists. This work will develop and test a rapid soil information system composed of three major components: 1) refining, testing, packaging and digitally connecting field soil test kits, 2) constructing and deploying a mobile laboratory equipped with state of the art near and mid infrared spectrometers, and 3) linking and analyzing the field kit and mobile lab data through ICT technologies to make real-time soil management recommendations at the “digital central” operations.